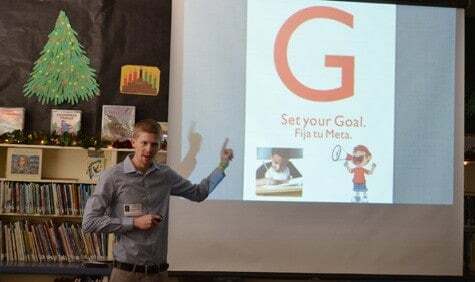 What grade level is this presentation designed for? This presentation is designed for PreK-3rd grades. The concepts and overall performance is designed specifically for this age group. Also, our books are written for these grades levels, making the entire author visit more relevant. Do you have a one-page overview I can show my principal? Is this presentation only for my bilingual students, or for all classes? For everyone in ages PreK-3rd; regardless of language background. Our presentation is centered around reverberating the message that reading translates into reaching your goals, and this helps to excite children to read more often. Our presentation and books really strike a chord with dual language students, as this is what our company’s mission and values are all about. 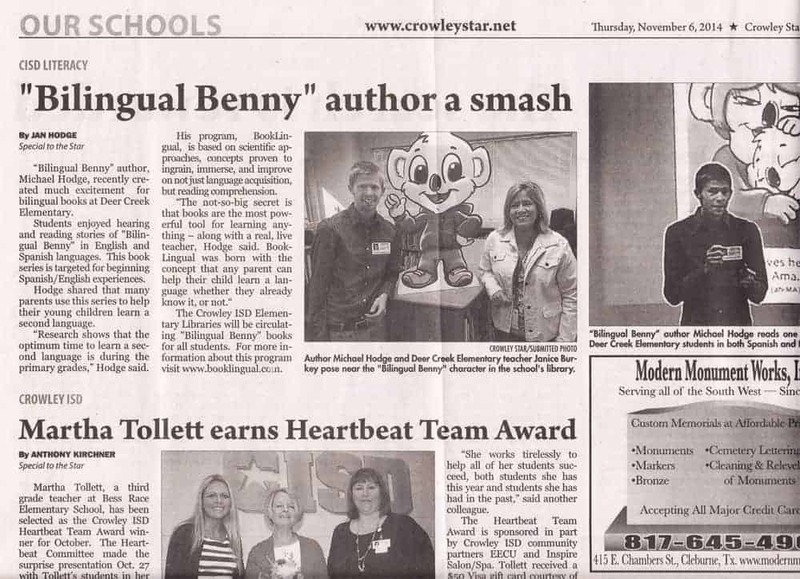 Non-bilingual students will still have fun learning some Spanish; and discover that they can also learn a new language, and laugh alongside Bilingual Benny’s hilarious antics! Do you present in both English and Spanish? Yes. we present in both languages, and accommodate all students in the audience. We will vary the language depending on the group at hand. How long is the author visit, how should we schedule it? Each presentation is 30 minutes. This is packed with reading a few books, interactive student involvement, Q & A, and more. At the end of each presentation, we will distribute pre-ordered books. We have a Morning Visit Schedule, and an Afternoon Visit Schedule. We can change the order of the grades, or make small time changes if needed. We can visit two schools in one day, within the same vicinity for our school tours. The presentations can be held in the library if there is enough space, or the cafeteria/auditorium. Is this assembly only for dual language or bilingual schools? No. Actually the message and concepts taught are relevant and extremely powerful for all children in grades PreK-3rd. 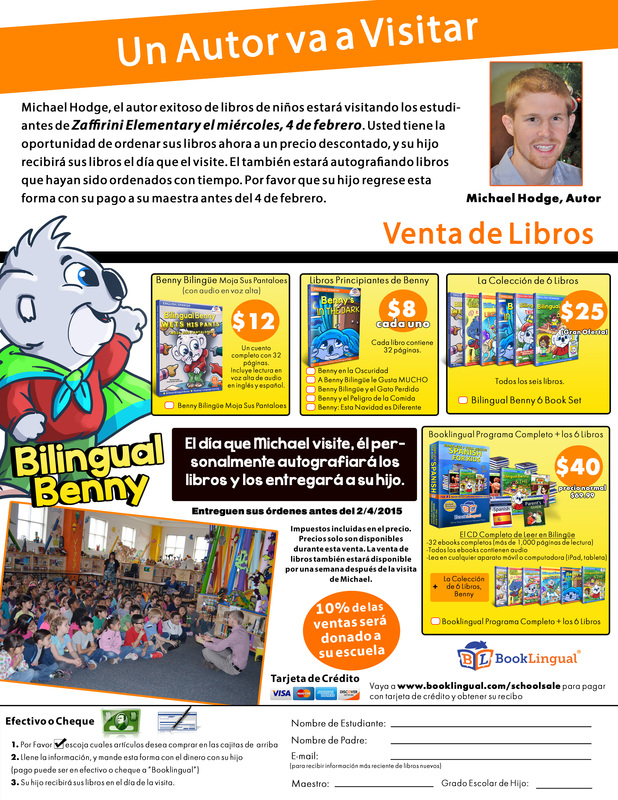 For children who are not bilingual, this is a fun way to be introduced to a foreign language, learn Spanish words, and meet an author. 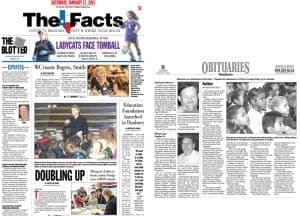 We just happen to have a unique understanding and background with dual language schools. Our entire program and experience is always tailored to fit the school we are visiting. What benefits will my students get from this assembly? 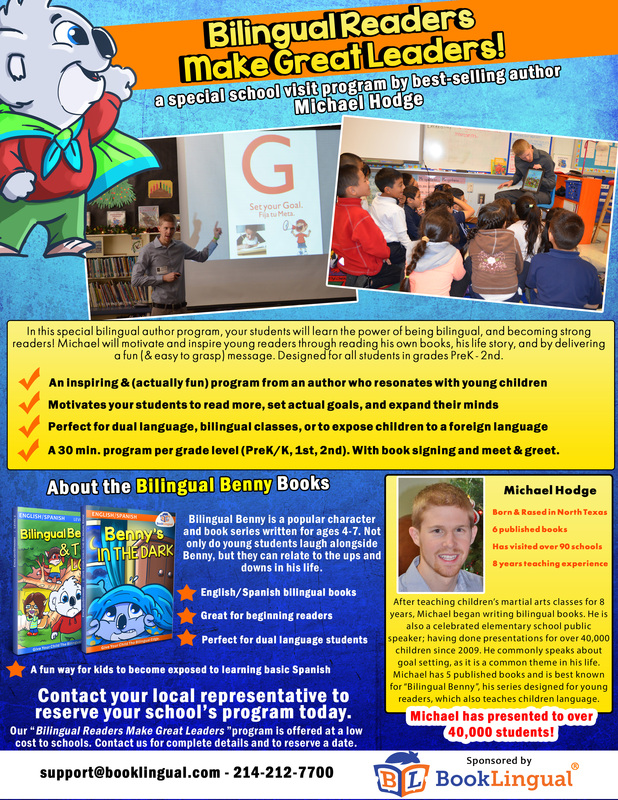 The assembly is based on the theme of “Bilingual Readers Make Great Leaders.” The presentation is centered around reverberating the message that reading translates into reaching your goals, and this helps to excite children to read more often. Students will also learn the power of becoming bilingual, and realize that reading and writing will take your language abilities to new heights! They will learn how to set a goal, the importance of reading, about learning a new language, and authorship. $300 appearance fee and $150 travel fee. The travel fee simply covers lodging, airfare, rental car, meals, gas, etc. A “school tour” is when there are 2 or more schools scheduled in the same area. Our school tours (shown above in the graphic) book quickly, but we can possibly add a few more tours if you can gather enough schools in your district to schedule at once. $500 appearance fee and travel expenses. This is for schools who schedule by themselves, and our availability is usually much more flexible. How does the book sale work? What are the book prices? Make copies of the pre-visit flyer (two sided, front English, back Spanish is best); and send home to all students two weeks before the date of our visit. During the week, the students/teachers will turn in their order form, with cash or check (made out to BookLingual) to you. Or, they will turn in their order form with a credit card receipt from our website (if they paid via credit card). On the day of our visit, please have a projector hooked up. Also, a microphone and a table at the front. After each presentation, We will personally distribute the books, take photos, meet and greet. There is also a one week book sale after our visit, as many students/parents/teachers tend to buy books after they have actually seen our presentation. We will have a box of extra books and pre-sorted flyers when I arrive. These will be for the one week sale after our visit. At the end of the week, any leftover books, and the payments are sent back in this box which has a prepaid shipping label on it. We try to have everything done for you, so there is no stress. The reason we charge a reasonably low appearance fee, is that we can bring in some income from the book sale as well. Even better, students and families will learn a great deal from our books, and improve in their bilingual reading and language skills. Here is an example of the English side of the pre-visit flyer, and the Spanish side. Do you visit any school in the country? 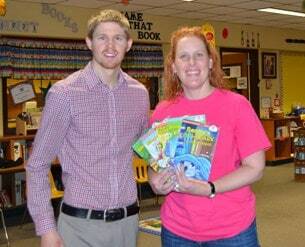 Some photos from recent author visits presentations. Book Your Author Visit Now!